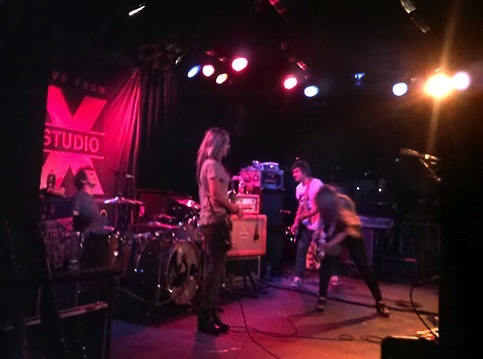 Veruca Salt finished their homecoming with a Live from Studio X performance at Martyr’s Monday night. Nina said that she saw a lot fans there from the other two nights that they played in Chicago, Saturday at the Beat Kitchen and Sunday at Wicker Park Fest. Lucky WXRT fans won tickets to this intimate performance to see the band play songs from their new album, Ghost Notes which was just released July 10th. They played four songs from the new album and “Seether” from their first album American Thighs. They did come out to do a special encore of “Eyes on You”. Louise said that she did not feel that her vocal performance the first time that played this song was up to par, because of all the singing she did the past couple days. She said, “We’re going to do this again because we want to play it right for you”. I would like to give a big thank you to 93 XRT and Marty Lennartz for hosting this special event with Veruca Salt.